A vast ship graveyard on the western shore of Charles County has the wrecks of more than 230 ships, including 81 wooden steamships built by the U.S. Government during World War I. The shipwrecks, mostly surplus government vessels, have been ignored for more than 50 years. In 2015, the National Oceanic and Atmospheric Administration (NOAA) proposed creating a National Marine Sanctuary at the site. The State of Maryland has expressed an interest in designating the area as a state park, similar to the Black Panther Historic Shipwreck State Preserve near Point Lookout. The area is accessible only by boat; the Potomac shoreline here is in private ownership. The inaccessibility is part of its attraction as a dumping-ground for obsolete ships. Attempts were made to salvage scrap iron from the ships during the Great Depression and the early 1940s. Bootleggers also favored Mallows Bay because it was easy to elude authorities among the shipwrecks. The wooden steamship fleet was created by the U.S. government as an effort to preserve precious steel during World War I. The steamships were not practical, however, and many ended up parked at Mallows Bay. Salvage workers concentrated on the 20 tons of bolts in each ship. Access today is by shallow-draft boats such as canoes and sea kayaks. For more information about the "Ghost Fleet" of Mallows Bay, select this link. Mallows Bay is part of the Lower Potomac River Water Trail, which goes from Washington, D.C. to Chesapeake Bay. A special kayak launching area makes paddling access easy. 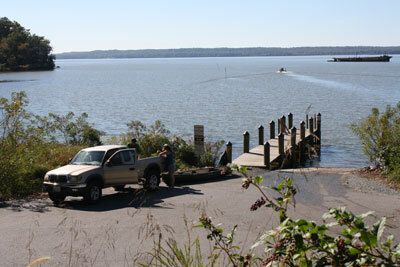 In 2010, the Charles County Government opened a small park near Mallows Bay to improve access to the site. The boat ramp is located at 1440 Wilson Landing Road, Nanjemoy, MD. It is open 7 AM to dusk, year-round. The site is located about 2 miles upstream from Purse State Park. It is described on the publication Water Trails in Charles County. Select this link to download a copy of the map. Mallows Bay Park is part of the "Find Your Chesapeake" project of the National Park Service and the Chesapeake Conservancy. Click here for details.